I have had a bad cold (and no, I don't believe my shrimp caught it). A little over a week ago, my friend lent me a humidifier and some eucalyptus "100% essential oil" to be used with the humidifier to help with my congestion at night. The eucalyptus oil created an odor, as you would expect, that lingered for days after the humidifier was turned off, and pretty much permeated the whole house. After a couple nights using this humidifier and oil, I noticed the Scarlet Skunk Cleaner Shrimp in my bedroom tank seeming lethargic and not eating, then a day later I notice a similar problem with another Scarlet Skunk Cleaner Shrimp in my downstairs living room (a different room on a different floor, but on the same air circulation system). Suspecting the eucalyptus oil as a likely problem, I discontinued its use and moved it and the oil bottle to the garage. I also changed 20% of the water, and replaced the activated carbon with twice the usual amount, in my bedroom tank. The next day, the shrimp there seemed a little better, so I also replaced the activated carbon in my living room (but did not change water, as I did not have enough available). I noticed the shrimp in the bedroom tank being harassed by the Lemon Peel Angel, who normally would go to the shrimp for cleaning services. As I watched, I noticed that the shrimp did not seem to signal his willingness to clean as he had before, and I wondered if this inappropriate behavior (for a cleaner shrimp) causes the angel to respond inappropriately. I also notice that this shrimp's tentacles do not seem as straight as I remembered them being (he had molted a few days before all this started). All my fish and hardy soft corals seem fine. So, what is my question? Mainly this: do you think it is likely that this airborne eucalyptus oil is the cause of problems for my shrimp? Perhaps you don't (or can't possibly) know, in which case my email will serve as a caution about a possible risk of using eucalyptus oil around marine aquaria. I'm amazed by the ton of valuable information posted on the FAQ dedicated to L. amboinensis, but unfortunately did not find any for my case, which I will describe below. My three L. amboinensis died (one died first, three weeks ago, and remaining two passed away yesterday). Symptoms were similar : they had some kind of brown algae on the antennas and the thorax, and considerably reduced their activities since then. I assume this is a disease or a parasite, but could not find any related resource on the web. Have anyone ever heard about such case ? Can you be more specific about imbalance ? I do not supplement anything (old school, I know…). macro algae, 4 cleaner shrimp, 4 fire/cherry shrimp, 6 peppermint shrimp, snails and two H. reidi seahorses that have babies every couple of weeks. Everything except the peppermint shrimp has been in the aquarium for at least 6 months. There are also two hitchhiker crabs that we haven't yet been able to catch. 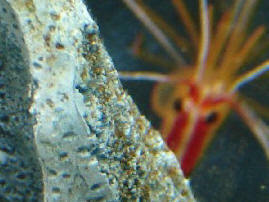 Last week we added the peppermint shrimp to help get rid of a few Aiptasia anemones that were starting to grow. We service the aquarium every two weeks with water change and filter maintenance. The shrimp and seahorses are well fed and I must say, voracious eaters. Last night the client said a couple of the cleaner shrimp started to die. Today when we arrived all cleaner shrimp and fire shrimp are dead. Peppermint shrimp, seahorses and corals all appear normal and healthy. Tank parameters are normal, temp, salinity, ammonia, etc. What might cause this mass die off of a particular species of shrimp? wacky micro-mineral levels (although we do regular water changes with high quality reef salt), or perhaps the peppermint shrimp introduced some sort of parasite or disease? Any ideas would be tremendously helpful. Hi Bob, sorry for the delay but I wanted to say a huge thanks for your time & help with our question. Chemical media went in and so far everyone else is doing great! First off, a big thank you for all the information that your site provides for those of us in the marine aquarium hobby; the aquarium world is just a better place with you guys around. Well, I'm writing because I have this problem with shrimps - I have 0 out 3 success in my attempts with introducing this creature in my tank. I don't understand why, but they keep on dying within hours after being added in the DT. The most recent died less than hour. Sheesh! What I don't understand is that my other inverts are ok. I have several snails, a hitchhiker starfish, several tube worms, and a tube anemone. All doing fine. Some of them were introduced at the same time with the deceased shrimps. Some info - tank is 19G, fishes - clown, YW goby, Spotted Cardinal. Water parameters - Ammonia 0, Nitrite 0, Nitrate 10ish, Temp 84F, SG 1.024. Don't have kits for calcium & phosphate. I read somewhere that when livestock die within hours that it's an acclimation issue. My LFS has an SG of 1.018.
with differing duration, 1hr, 1.5hr, 2.5hr and still they keep on dying. With this much difference in SG, how long do you think should I acclimate shrimp? I'm writing in the hope that you can offer some advice on how to proceed with my tank. I've had my 56 gallon up for over a year now and have stocked with 3 fish and 3 shrimp along with a clean up crew and some LPS/SPS/soft corals. Recently, my shrimp started dying. They are normally reclusive creatures (being shrimp.) and hide. But they have recently started running across the sand bed haphazardly, running into the walls of the tank/rocks and exhibiting other signs of ataxia. I cannot figure out what is going on. My parameters are normal across the board. pH 7.8, SG 1.024, Ammonia 0, Nitrite/Nitrate 0. All three of the shrimp molted recently after my last water change. The fire shrimp seemed to have difficulty with the molt and I found him in the morning on the sand, struggling with the old exoskeleton. Two of my three shrimp passed away yesterday after first displaying symptoms of distress 3 days ago. I had recently prophylactically treated the tank with Praziquantel (but don't think this is the issue). My last shrimp is a pistol which has been paired with a goby for the last year (Shrimp Buddy). Shrimp buddy is now exhibiting the same symptoms as the others and I fear that he might die soon. He is crawling around the tank and seems to have difficulty getting several of his legs to move. One option that came up is to add additional iodine to the tank to induce a new molt. Is this a good option? I really want to save Shrimp Buddy, but if I can't, I'd really like to know how I can prevent this in the future. I have a low light reef that has been up and running for over a year, but recently I've been slowly losing my cleaner shrimp and Emeralds Crabs. It's possible a few hermits have disappeared also but I'm not 100% sure. My fish, corals and snails are all perfectly fine. I use IO salt kept @ 1.025-1.026, PH is fine and stable, no nitrates or ammonia, weekly water changes with treated and treated tap water, I haven't recently tested calcium, Mag or Alk but there is plenty of healthy coraline algae. The only think I can think of is the animals I'm losing are the type that molt and I don't recall seeing many molts lately. These poor creatures have been in the tank since the beginning and have now been slowly dying for about 3 months. They don't get mangled or eaten in any way, I find them looking sick or already dead. I've tried taking the sick ones out and setting up a separate tank, even trying RO water in the hospital tank instead of the tap water in the display. The only thing the same in both tanks is the salt. Is it possible there isn't enough iodine in IO's salt lately? That seems unlikely to me, but at the same time do you think that makes sense since only the molting animals seem to be dying? I've never seen an iodine test, perhaps it's time to look for one. Any help would be appreciated! <Two things come to mind. Are the shrimp and crabs getting enough to eat? level in the IO salt, and for that matter, calcium or magnesium as these elements are slowly depleted by the animals/algae that require this. These parameters should be tested regularly and supplemented when necessary. If your fuel gauge didn't work in your car, would you always know how much fuel you have remaining, or would it be "I think I have enough left". Skunk shrimp bubble 3/30/06 Hi guys, <Henry> I have a question I can't find an answer for in the FAQ. I bought a skunk cleaner shrimp three days ago. It molted yesterday. I didn't know I was supposed to leave the exoskeleton and promptly removed it. (I know, I should have read more first!) Today it ate flake right off my finger. This was the first time I saw it eat. Shortly after that, I noticed what I can only describe as a bubble on one side of it's body, a bit below it's head. It looks as if a little balloon has been inflated. His coloring is yellow, and he is attached to a rock and moving about on it just as he's been since I brought him home. Any idea what this bubble is? <Mmm, not really... a pic would help. Not likely however that this is anything you can or want to try to "treat". Do be careful re making sure your water is very consistent in changing out... and sufficiently high in biomineral, alkalinity and pH. Bob Fenner> Thanks in advance, you guys do a great job here!